Bulldozer-city tactics again, Boys? Look what happened to the bluestone wall in the High Street car park, to be retained by conditions of an archaeological authority—last photographed by ODT this summer, in a state of neglect with weeds all over it (having been ‘nudged’ with an excavator during construction of the car park). That should have been a prosecution. Not sure you can get off the same hook twice. 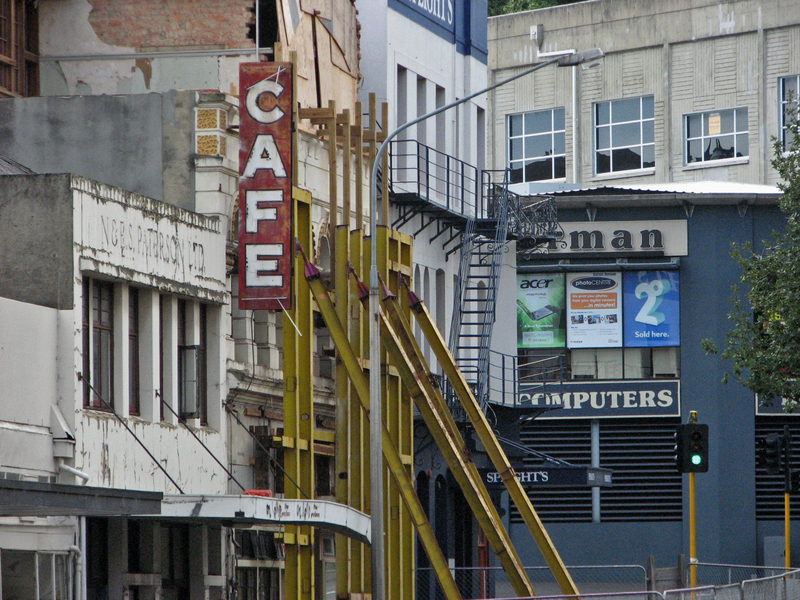 Demolition work is due to restart soon on on two adjoining buildings in Rattray St, Dunedin, more than a year after the roof of one of them, the 136-year-old [Barron] building, collapsed. Stuart McLauchlan, a director of the Scenic Circle Hotel Group, which owns the N. & E.S. Paterson building beside the [Barron] building, confirmed yesterday that demolition on the two buildings, which share a common wall, should begin within in the next few weeks. But the Historic Places Trust says an archeological authority needs to be done, at least on the [Barron] building, before any demolition work begins. Urban blight in the hands of expensive men. People love *cough* the frontage to Scenic Circle’s High Street car park (here seen from behind) – the architect more than completely failed. More joy for Rattray Street if this model is followed; the High Street car park is one of the worst pot-holing disasters in the central city. 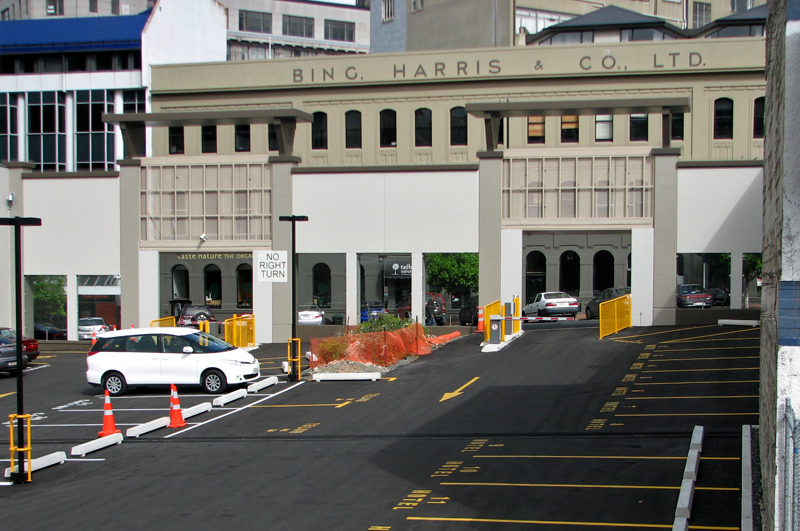 Not a desirable neighbour for the earthquake-strengthened and fully refurbished historic Bing Harris building across the street. The buildings for demolition at 173 and 175 Rattray St are both located in the North Princes Street/Moray Place/Exchange Townscape Precinct (TH03). A senior Otago Settlers Museum conservator who was sacked last year for serious misconduct has successfully taken a personal grievance against the Dunedin City Council, which has been ordered to pay him $34,446. The Employment Relations Authority found that Francois Leurquin was unjustifiably dismissed, but denied his application to be reinstated in his job. […] The breaches were alleged to have been made when he stored a ceramic piece he had agreed to restore for $200 for a private client, in packaging brought in from outside the museum […] risking contamination of the museum’s artefacts, which his employer was entitled to find amounted to serious misconduct. A remarkable comment in the face of the rugby scrum that parades as the annual plan / long term council community plan process at Dunedin, a process well tinged with lies, deceit, incompetence and further mismanagement of ratepayer funds by our elected representatives. This after years of council grey papers, staff manipulations, and unholy alliances with gentlefolk in the private sector whose names are well known. The Dunedin City Council gave approval for a second “targeted rate” system to improve city buildings yesterday when it voted for a scheme to help fund earthquake-strengthening for heritage building owners. That followed a decision on Tuesday to back a similar scheme to fund insulation and clean heating for residential buildings. 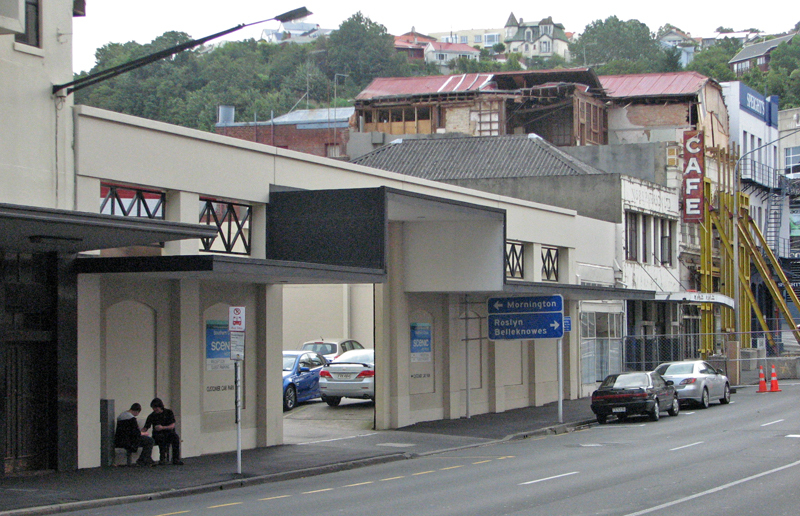 The voluntary targeted rates schemes work by providing finance to ratepayers – in this case to complete earthquake-strengthening – with the cost to be paid off through rates over a specified period. • There would be about $500,000 available in the first year. • Applications would be considered by the four city councillors on the Dunedin Heritage Fund, and three New Zealand Historic Places Trust representatives, with a final decision by the council finance, strategy and development committee. There were emotive arguments as Dunedin city councillors split into camps over the restructuring of Forsyth Barr Stadium debt repayments to a 40-year term yesterday. The move was approved by Dunedin city councillors for inclusion in the 2012-13 pre-draft annual and long-term plan yesterday, alongside a push to restructure repayments in later years to more quickly reduce the debt. It meant the council would be receiving the same rates as it would have from properties previously occupying the stadium site. Dunedin city councillors have given initial backing to a proposal to slash the Forsyth Barr Stadium’s $2 million annual rates bill. Councillors at yesterday’s pre-draft budget meetings voted in favour of resolutions that would cut the rates bill for Dunedin Venues Management Ltd – the company running the stadium – from $2 million a year to a more manageable $134,000 a year. That amounted to a 93% discount on the venue’s city council rates. An artificial turf, seen by Dunedin City Council staff as the future of sports fields in Dunedin, stayed in the city’s annual plan by a single vote yesterday. Councillors, gleaning from press statements and your preliminary discussion of the (draft) Annual Plan 2012/13—as relates to the Long Term Council Community Plan (LTCCP)—it appears that your chief financial officer has unilaterally committed the Dunedin City Council to a 40-year stadium debt plan – without your knowledge and vote of approval, with serious financial implications. Whether this is true or not, you have a PROBLEM. Agree to open the council books, and those of the related entities including DCHL, CST, DVL, and DVML, for a full independent forensic financial investigation, now. The Dunedin City Council will consider borrowing from its own almost $70 million Waipori fund, instead of using commercial lending institutions. The idea would be to provide regular income to the fund through interest, and produce a situation where the council would, in effect, be paying interest on its loans to itself. Communities across Dunedin will need to do more to help pay for projects, as the Dunedin City Council grapples with tight finances threatening to curtail spending on key ventures, Mayor Dave Cull says. The warning came as councillors met in public yesterday for the start of a two-day meeting to discuss the council’s 2012-13 pre-draft annual and long-term plans. The early budgets forecast a 4.7% rates increase from July 1, but councillors were also grappling with a list of about 40 unfunded projects – including the proposed $11.5 million Mosgiel pool and a new South Dunedin library – yet to be included in the council’s spending plans. The top five projects, in order, were a new Maori consultation model, Ocean Beach erosion work, Caversham tunnel work, repairs to the St Clair sea wall, ramp and stairs, and a new council energy plan. [Added items] The council’s share of the Blueskin Bay library ($745,000) and priority parts of the strategic cycle network ($1.5 million over three years) in South Dunedin.